Disclosure: I am part of the PTPA Brand Ambassador Program with Restonic, and I received Compensation as part of my affiliation with this group. The opinions on this blog are my own. How much sleep did you get last night? Most people need 7.5 to 8 hours of sleep each night, but some people need a little less or a little more. I definitely need a little more than 8 hours to function properly. If I get any less than 8 hours, I'm not pleasant to be around the next day. I'm not a good mom, I can barely form a coherent thought to write, and I don't have the motivation to clean the house. I used to have the notion that getting a full eight hours of sleep was a luxury. It's not; it's most definitely a necessity for me. When I get enough sleep, I am a much nicer mother and wife, and I'm more likely to do fun things like bake cookies and form complete sentences. Sound familiar? Then read on for my top tips to getting a good night's sleep, and see how I'm going to improve my sleep over the next month. I need to be comfortable to sleep. I like my room slightly cool with a thick comforter, so I adjust the thermostat accordingly. Having a comfortable mattress also makes a big difference. You should replace your mattress every 8 to 10 years. Comfortable pillows are also important, and anti-allergy pillows are a great option even if you don't have allergies. Before I got on a good sleep schedule, I felt like I could nap every day. Of course, this would cause me to stay up later, which meant I was tired the next day. It's a vicious cycle. If you do get behind on your sleep, try a 20 to 30 minute nap in the early afternoon rather than sleeping in or a later nap. When I feel myself starting to get tired after 2:00 p.m., I get up and start moving so I won't fall asleep. It's so tempting to crawl in to bed and catch up on my favorite TV shows or check my email on my iPad. Screen time right before bed is very stimulating for my brain, which makes it harder to fall asleep. This is my only quiet time during the day, so I do have a bad habit of being on my phone or iPad. This is definitely one thing I need to work on this month. I can't sleep if I can't relax. I've had weeks where I couldn't sleep because I was worried about something, and I know that this isn't healthy. Now when I can't sleep because of anxiety, I have a few tricks. I keep a notebook beside my bed and write down my worries and fears. Once I write them down, I can't allow myself to think about them anymore until the next day. Just knowing that I have them written down to save for another time allows my brain to shut off for the night, which means I get restful sleep. I also use a relaxation spray to create a restful atmosphere in my room if I'm particularly stressed. Keep my consistent sleep and wake times. Not take a nap after 1 p.m. and limit any naps to 30 minutes. Read a real book before bed instead of my Kindle. Also, no iPad or phone use in bed. Go to be at 9 p.m. so I can sleep by 10 p.m. for 8.5 hours of sleep a night. Be sure to come back next month to see how I'm doing with my sleep goals. I'll also have a great giveaway from Restonic Mattresses! 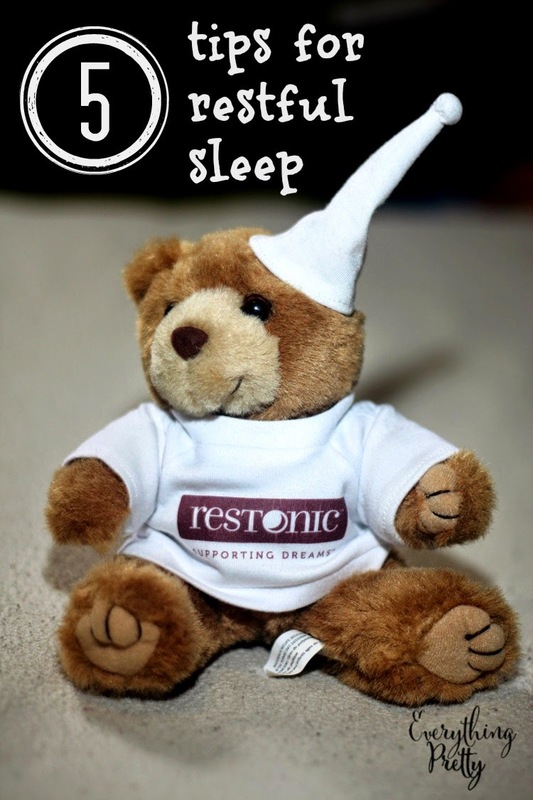 Learn more about the importance of a great mattress for a great night's sleep by following Restonic on Twitter or Facebook. Get more sleep tips and join the conversation by following #GoToBed on social media. What prevents you from getting a good night's sleep?